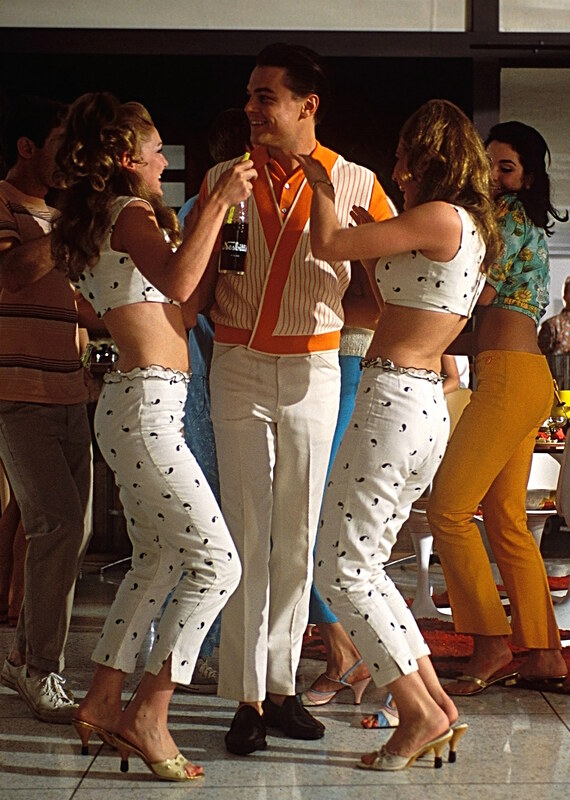 Having made a fortune from passing his forged checks posing as a Pan Am pilot, 17-year-old Frank Abagnale Jr. is living the high life, hosting a fondue party in his swanky Atlanta condo full of era-specific goodies like The Kinks’ “You Really Got Me” on the Hi-Fi and Nesbitt’s soda in the hand of every giggling go-go dancer present. Christ, Terry! This is Italian knit! Frank seems to be the only one unable to relax at his party, but how could one be expected to relax with clumsy friends like Terry and Lance, the latter of whom falls into the “conversation pit” and sets the next deceptive chapter of Frank Abagnale Jr.’s life in motion. With its bright colors and sharp angles, this orange knit self-cardigan polo shirt exemplifies these “sixties vibes” while also clearly differentiating Frank’s new jet-setting lifestyle from his drab but legal and age-appropriate high school life. Little did Frank know his trip to visit an injured friend would become a job interview. 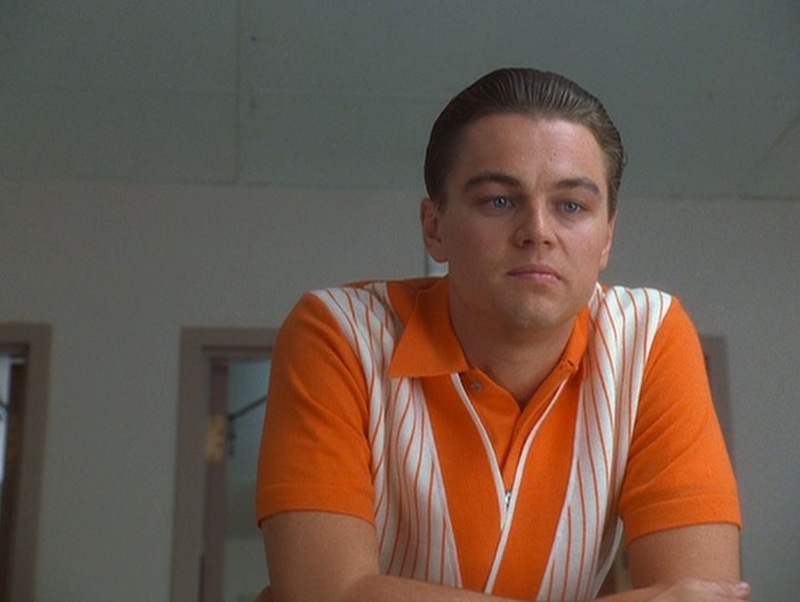 Frank’s unique shirt essentially consists of a solid orange knit short-sleeve polo with a cardigan-like layer attached at the shoulders that drapes across the front of his torso like a double-breasted waistcoat. The polo has three smoke gray plastic buttons with the top button worn open for the large soft self-collar to flap over the top layer. A smaller smoke gray button on the back of the collar holds it in place. The cardigan-like layer is white with orange stripes to match the shirt below it. Thicker orange striping follows the edges of this layer, forming a sharp sideways “V” where the left side crosses over the right at the waist, stitched in place in the bottom corner to keep the front layer from draping open. The elasticized bottom is straight-hemmed. We all know that feeling when your house is full of uninvited guests making a mess of everything. Frank coordinates his trousers to his shirt stripes with a pair of white cotton straight-leg chinos. The only two pockets are slanted on the front rather than along the sides with just a straight yoke across the back seat. The trouser fit is slim and straight through the legs down to the short break, plain-hemmed bottoms. The trousers have tall belt loops but no visible belt, although brown would match the shoes. Frank wears dark brown suede apron-toe tassel loafers, apparently sockless. 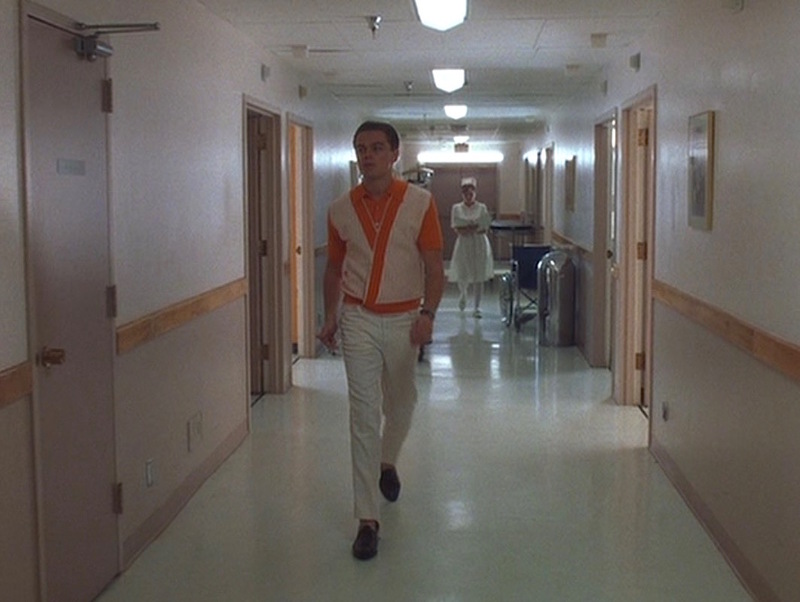 In his orange sherbet-inspired casual garb, Frank stands out against the hospital’s pale beige-and-mauve color scheme. While an aviator’s chronograph like a Breitling Navitimer may be more consistent with Frank’s pilot persona, he wears his usual steel-cased wristwatch with a black dial on a black leather strap. The exact model is unconfirmed, but Watches2U suggests this timepiece from the aptly named Dogfight watch company. Two different kinds of stripes. DiCaprio and Spielberg on set. Seemingly inspired by orange sherbet, Frank’s brightly colored and uniquely styled casual knitwear signifies his newfound popularity among the mid-’60s jet set crowd. While I have no doubt that Frank’s Italian knit layered shirt is inspired by actual men’s fashions of the ’60s, I’ve yet to actually see a contemporary example of it whether in a movie, TV show, or catalog. If anyone knows more about this specific style or has seen it elsewhere, please feel free to share! I’ve been meaning to get this movie for some time, since it’s been fifteen years since I last saw it. The watch, though, can’t be that dreadful Dogfight brand “timepiece”. Reason being that it’s a 44mm diameter and Leo D doesn’t strike me as having a wrist large enough to make this size of wristwatch look small. The mid 1960s were awash with cool and simple wristwatches and, while black dialled watches weren’t as prevalent as lighter-coloured ones, brands such as Tudor and Universal Geneve did produce some stunning watches with black dials. So, nope, this ain’t no Dogfight wristwatch, in my humble op. Ah, good point! It’s a pretty entertaining film; it seems to be one of the few I’ve seen with considerably universal appeal. I hope you’re able to check it out again soon! I appreciate your horological insight 😉 I doubt as well that it would be the Dogfight, I just wanted to present the only other perspective I’d been able to find. Until I convert my entire DVD collection to Blu-Ray (and then have a way to watch it on my computer for screengrabs), I’ll need to continue my search for production photos or a confirmed brand to find out what’s on DeCaprio’s wrist! 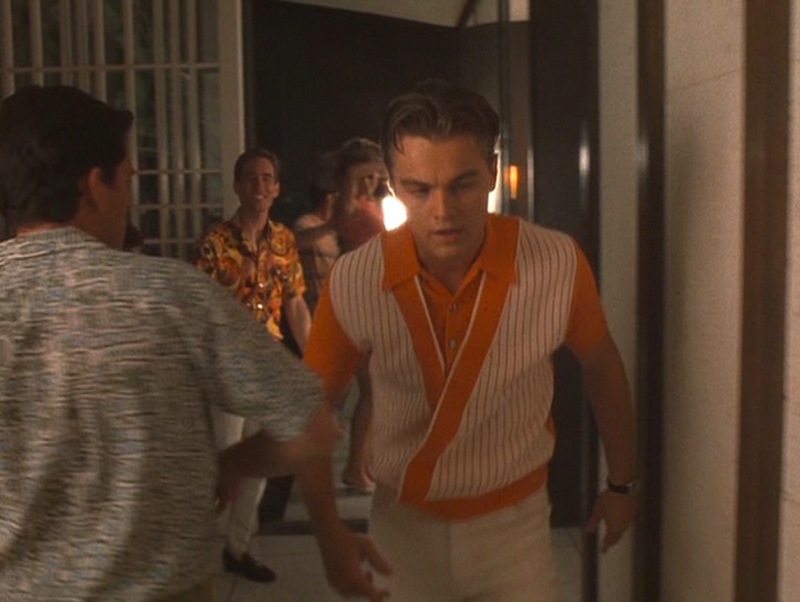 Please, take a look at De Caprio’s expedition shirt in “Blood diamond”. does anyone know what this polo is called or where I can purchase one? I like the knit very much where can l get one ! ?